An 1881 Morgan Dollar with original mint luster. Mint Luster on a coin's surface is the sheen, or reflective qualities are produced during the minting process. When a coin is struck, metal flows from the center of the coin towards the outer edge. This process produces microscopic striations (very tiny parallel grooves) that reflect light back to the viewer in a unique crossing pattern. If you tilt the coin under a light, this crossing pattern will spin around the coin. This swirling effect is known as the cartwheel effect. Mint luster is exceptionally delicate and can be damaged or destroyed by friction from other coins or objects that rub across the surface of the coin. You cannot repair nor restore the striations after they are destroyed. Any attempt at restoring mint luster is considered "Coin Doctoring" or altering the surface of a coin with the intent to deceive a buyer. Luster, or mint bloom or frost, is one of the most important aspects of grading in the Mint State category. All other things being equal, a coin with rich, deep mint luster is a better candidate for a higher grade than is one with a dull or lifeless luster. One rule does not fit all; luster can vary from type to type, and examination of a wide selection of coins in the marketplace is the best way to gain expertise in this vital feature. Many people think that a clean and shiny coin is worth more than a dull and toned coin. Unfortunately, most coin collectors and numismatists prefer original surfaces over coins that have been cleaned in an attempt to restore the damaged mint luster. Harsh and abrasive cleaning techniques that use acids and abrasives remove the mint luster that has been imparted on the surface of the coin during the minting process. After a coin collector has dipped a coin too many times, it will be described as "impaired luster." Improperly cleaned coins will exhibit a muted or subdued luster. Uncirculated coins that still have their original surfaces will show a flashy and bright mint luster that will dance across the coin as it is rotated and tilted under a light. Coins that have toned over time still exhibited a bold and crisp mint luster even if it is across a coin that does not have its original mint color. Original mint luster is one of the essential components when determining the grade of an uncirculated coin. A coin that has original and flashy mint luster will have a better eye appeal than one that has had its mint luster muted or damaged. Coins that grade About Uncirculated or below will usually have areas on the coin where the mint luster is broken or missing. The evidence of broken mint luster is one of the critical factors in determining that a coin is not a mint state coin. If a coin has details that indicate it has been in circulation, and yet it exhibits some sort of flashy mint luster, this is evidence that somebody has doctored the coin in an attempt to make it look uncirculated. These types of alterations are considered deceptive by coin collectors and coin dealers and may also be illegal if you intend to deceive your buyer. If you are still having problems recognizing what original mint luster is, visit your local coin dealer or a coin show and look at uncirculated coins that have been encapsulated by third-party grading service. 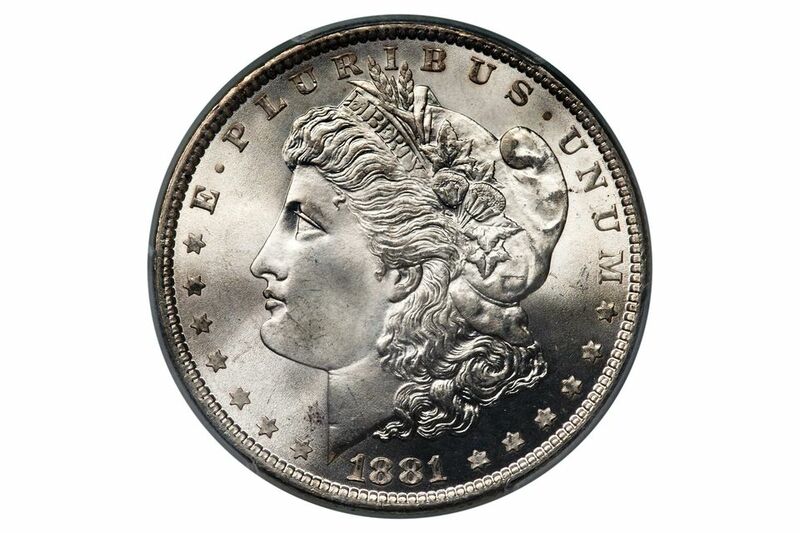 While you are there ask a dealer to see some uncirculated Morgan silver dollars. It will be easier to recognize on coins that are not toned. Ask him or her to show you what original mint luster looks like on one of these big silver coins. You will be able to see a distinct difference immediately.